British born actor Matthew Marsden has 38 films/television series to his credit and has played military characters many times. But it was an encounter with an Army Ranger during the filming of “Blackhawk Down” that inspired his commitment to supporting those who serve. Matthew asked the Ranger why he joined to which the young Ranger responded “For Freedom.” Matthew then asked “You’d die for me wouldn’t you?” To which the Ranger responded “Yes sir”. This experience inspired Matthew to really delve into the history and philosophies of the United States and what he shared on American Warrior Radio is one of the most inspirational conversations we have ever had. “There is nowhere else to go Ben. America is the last bastion of freedom on the planet.” Matthew Marsden will be receiving his US citizenship next year. Matthew wrote, directed and acted in “I Am That Man” because he felt so strongly that it was time for a Hollywood film that more accurately depicted the issues faced by Veterans reintegrating into civilian life. In order to assure that the film achieved his goals, Matthew reached out to several Veterans for their feedback and suggestions. He actually wrote a new scene based upon some of this feedback. 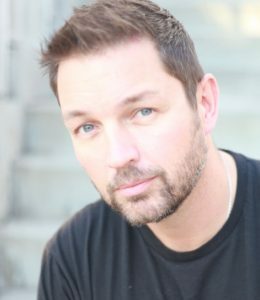 Retired paratrooper Matt James was one of the real Veterans that Matthew Marsden asked to review the “I Am That Man” script. Matt was medically retired after injuries sustained during combat operations in Iraq. 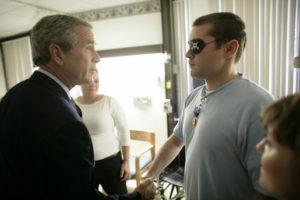 He was awarded a Bronze Star for saving a Marine’s life and his Purple Heart was presented in person by President Bush.